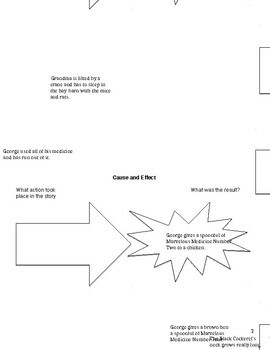 This is a Cause and Effect organizer that I made for George's Marvelous Medicine. 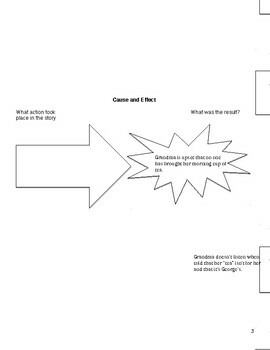 Students will fill in either the cause because an effect is given, or vice versa. They can fill this in either as they read the book or afterwards. I had my students wait until we finished the book to do this, but they were also high school special education students that I did this with. 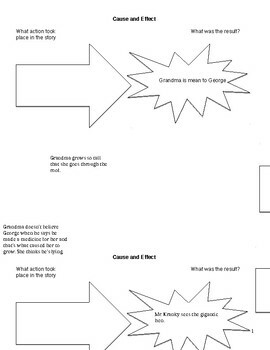 Younger students might need to fill it in as they read and there are class discussions. Hopefully this uploads ok. The thumbnails look different than what my actual docs look like, so if you buy this and the format is messed up, just message me and I can email you a copy of it.